Planning to visit Denali National Park in summer? Read tips for visiting Denali Alaska to see one of the most famous Alaska national parks. Find out about Denali national park lodging, when to book your Denali cabin, things to do in Denali National Park, Denali National Park entrance fees, and information about hiking in Denali National Park. This guide to Denali National Park is a guest post written by Kym from 33andFree! ​This guide to Denali National Park is a guest post written by Kym from 33andFree! The highlight of Denali National Park is Denali, the highest peak in North America. The Koyukon people have called it Denali for centuries, but in 1896 a gold prospector named it Mount McKinley to show his support of the presidential candidate William McKinley. Fast forward decades to 2015 when President Obama announced it would officially be called Denali after 40 years of attempts to change. Thousands flock to Denali National Park each year. The hiking and camping is like no other national park and the views can be a once in a lifetime moments. Tourists take a chance that they will get to see the peak. The cruise ship dropped us off at Whittier and we took a bus the rest of the way. You can definitely drive to Denali too. However, the best way is to take the train from Fairbanks to Denali. Beautiful train ride and they actually have decent food on it. How many days to spend in Denali National Park? It’s easy to spend two days in Denali National Park, however if you’re an avid hiker, a week in Denali National Park may be perfect. There are only a few hotels in the area to stay, however you need to book ahead if you’re not a camper as there aren’t many lodgings in Denali National Park. Check prices for Denali now! Regardless of where you stay, check the photos of where you’re staying carefully as some packages will use photos of The Lodge to advertise stays at other hotels. The Lodge is easiest if you have mobility issues as it enables you stay closest to dinner/shops. Keep in mind: You might still be paying luxury prices for accommodations that aren’t luxury elsewhere as Denali can be expensive to visit in high season. Look up your intended hotel before you book to get an idea of what services are offered. If you stay at Princess Talkeetna and Denali Lodge, you will need to take a shuttle to reach the food/shops, which requires that you’re outside (possibly in the rain) to catch it. Princess Denali is recommended, however it is 4/10th of a mile to the nearest food,. If you have mobility issues, look carefully into your Denali lodgings options before you book. There are 6 campgrounds in Denali National Park that can be reserved starting December 1of the previous year, so if you plan on camp in Denali, start planning early. Each campground in Denali has strict requirements on either length of stay, if it’s tent only and how you access it. Cars and RVs without a camping reservation are only allowed in the park during the summer months and are not allowed to drive past mile 15 on the road. Camping fee: Each campground is different. All prices are given at the time of reservations. If you are planning to bring your RV to Denali, the max RV Length is 40’ and the max stay is 14 days. There is a small grocery store near the hotels in Denali National Park, but for backcountry hiking, you need to bring all the food yourself. Plan to pay separate fees for mountaineering in Denali National Park, the Denali Road Lottery, commercial filming and professional photography program. Denali National Park is open year-round, however the road to access the park and visitor facilities are only open between mid-May and mid-September. There is only one road in the park. A 92-mile road that parallels the Alaska Range that is absolutely breath taking. After that your only access is one of their shuttle/tour services. Their strict rules with regards to vehicles inside the park are because there is only one road, the protection of the park and the protection of wildlife. However, you are allowed, to walk as much of that road as you want. Past Mile 15, you can take a a narrated tour (my recommendation), a shuttle bus, or camper bus. If you are hiking in the park you can pick up one of the shuttle buses at any point and get on, they are free. Check the schedule to make sure how far into the park the buses are going. We had started our Alaskan adventure with a cruise through Princess and as part of the package we added a 2-day land tour to Denali National Park. We stayed in their lodge and then booked a narrated tour. This was our best bet to seeing wildlife, but of course it’s not guaranteed. This is also the best way to see most of the park if you have one day. We got extremely lucky on our tour as we saw, multiple bears, elk, caribou, moose and my favorite the Arctic Ground Squirrel. The narrated tour to Denali National Park was about 6 hours. They had a couple bathroom breaks along the way and they only provided a box of snacks. They made sure that we gave them all the garbage. It is the only food and water allowed into the park (unless you’re camping). We had met up with people from the tour before and after us and they both mentioned they had not seen any wildlife up close and only a glimpse of a couple bears that were too far away to really see. I felt so lucky to have had the experience that we did. Fee for a tour or to use the bus: Amounts vary due to age, tour type or shuttle. Check online or call the park for current fees. If you plan on hiking, make sure to stop at a visitor center and grab a map of the park. When you do this also ask them for the areas that are closed. There are some permanent and some temporary closures to protect the wildlife. Reasons can include mating, birth and other territorial reasons, however it is important to remember that you are exploring the wilderness when hiking in Denali. There are only a few marked trails in Denali National Park that are not long. Get out and explore on your own, but remember Denali is HUGE and is almost the size of Massachusetts. Just follow the map and like I said, if you are close enough to the road you can pick up a bus to return to your campsite or outside the park (so also grab a bus schedule for that day). With this freedom comes great responsibility of knowing your surroundings for the safety of yourself and the safety of wildlife. Also, be smart and prepared for the type of hiking you want to do. Good hiking gear, snacks, water, water filtration, poles, maps, compass, bear spray, etc. Note: You need to have a permit to do backcountry hiking & backcountry camping in Denali National Park. The more adventurous camper will choose to backcountry camp. Again, there are no marked campgrounds, this is a time to truly test yourself and you will learn a lot about yourself. As long as an area isn’t closed, camping is open. Check the website for the process to obtain a permit for backcountry hiking and camping. There are multiple steps and requirements. Top thing to do in Denali National Park: See Denali! A lucky few get to see Denali. There are multiple stops along the road that you can see it on a clear day. It’s amazing how much the landscape changes as you drive down the road. You find yourself above the clouds, down below along a river and then driving through an arctic tundra. Another amazing thing about Denali is its geology. It is incredibly diverse and something to do a little research on before you go. Forests, rock formations, rivers, biomes, mountains, glaciers, and so much more surround Denali. Of course, the ultimate goal is to get to the point to see Denali. It was incredible. Your cell phone may not work in Denali National Park, depending on where you are. It’s best to invest in a high quality Family Radio Service for on-mountain communication. CBs are not monitored. If you plan on climbing Denali, you need to bring something besides your cell phone as cell phone coverage on the mountain varies and does not work on all parts. However, satellite phones will work on top of the mountain. Climbing Denali is a very difficult task and unless you’re a very experienced mountaineer with experience doing multi-week climbs, you should not try to climb Denali. It is a difficult climb only for experienced mountaineers. The US Army trains here to give you an idea of the difficulty…. Denali is the only national park with an active sled dog kennel. Teklanika West and Bull River II are two archaeology sites and are thought to be the oldest. Glaciers cover over 1 million acres of the park. Denali National park has about 6 million total acres. The only amphibian in the park is the wood frog. Crazy thing…they can freeze solid during the winter to survive and start breathing again in the spring. I can’t say enough good things about this park. I was in awe the entire time and it is a must do on any nature lover, photography lover, animal lover’s list. It isn’t the easiest to travel to, but that’s what keeps it raw and mysterious. The vastness and all the new things you get to explore will keep you captivated. For more hiking tips in America, follow Kym’s adventures across the US at 33andfree, which is on Instagram, Pinterest, and Twitter. Denali is one of those places that I have dreamed about visiting for such a long time. These are great tips and I just wish that I had a trip there planned. I would love to experience this natural beauty for myself. Love your pictures! 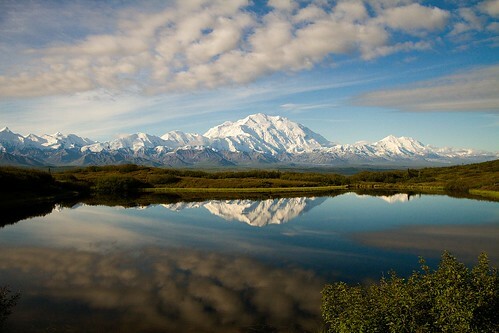 Denali is on my list to visit! When I visited Alaska a year ago we just did the touristy cruise related stuff but I would love to visit the national park. Saving this guide for later! What time of year did you go? It looks lovely!! I’d love to explore this National Park. I love hiking. A summit hike is always tempting but well, I’m not at the level of fitness and experience of the military so I’d pass! 😉 Thanks for sharing these great tips! This just makes me dream more about the beautiful parks in North America! Love how many tips and details were given. So Denali is a shy mountain, should check the visibility before going I guess! Beautiful and peaceful! I would love to visit Alaska one day, so I will definitely be saving your post for future reference. How fun to get to view the wildlife in their natural habitat! What a beautiful place to explore! I love all the wildlife in your photos. And the wildflowers are stunning, I’ve never seen them that pink! Oh gosh, this looks beautiful! I would love to go to Alaska – I’ve been to almost every state of the US (Hawaii included) but Alaska is still on this list. I love the moose! This was so helpful. Denali looks absolutely stunning! I love national parks but I’d never heard of this one until I read this post by Kym. I’d love to camp here but the lodge looks nice too. Can’t believe you need a permit to hike there, never heard of that before! Thanks for sharing these tips and info about Denali National Park. We will be visiting in May with an RV. I can’t wait to finally get there!